I was getting ready to answer a friend’s email question on how she could find someone to help her organize her guest room, and I decided to provide the information in this blog since many of you may be wondering the same thing regarding home organizing. Before I provide you the guidelines for selecting an organizer, I’m going to share my own journey on learning about this business and how I’d go about finding the perfect match for a home or business organizing project. When I first opened Photo Nanny and told my friends and family I planned to organize photos and create custom keepsakes for a living, most of them said, “Is being a photo organizer a business?” At the time nine years ago, I thought it could be a business, and I embarked on a mission to figure out if my passion and people’s need for help with their memorabilia could gracefully make a connection. Having six staff members now, 2600 square feet filled with precious photos and memorabilia and a very busy calendar, I think the answer is a clear and resounding YES! The interesting part about my journey in this business is that along the way, I learned that organizing “stuff” is a profession, period. “Who’d have thunk it,” my Dad would probably say. I mean, after all, my mother is the most organized person I’d ever known (I guess some of that DNA came through the womb to me)…and she never knew about the opportunity to professionally help others get their lives, homes and businesses sorted out, or I think she’d have gladly jumped in to use her skills in that way. Instead, she had everything from the kitchen drawers and cabinets organized (and labeled), our clothes had name labels (every single sock) for easy sorting, and the organizing never stopped. She had our entire home inventory in a Word Perfect document (remember Word Perfect?) so we could type in anything to figure out where it was in the home, garage or attic. Need a pair of striped tennis shoes from a costume we used ten years ago, boom, it’s in Box 1, Beam 22 in the Northwest grid of the attic. (Yes, she had our entire attic organized). Anyway, along the way, I learned there are others in the world as organized as Mom and there’s an organization for them….and no, not it’s not a 12-Step Program. It’s called NAPO, the National Association of Professional Organizers. I learned about NAPO because as a photo organizer, I found myself constantly looking for the perfect box or tool and frequently shopped at the Container Store. Each time I would check out, the cashier would ask me if I was a member of NAPO. So, I looked into it and lo and behold, there are other people all over the country helping professionally organize homes and businesses. I quickly learned NAPO exists as a forum for training as well as colleague support; so, I signed up immediately! There’s great information about the association at the NAPO website http://www.napo.net. And whether someone is interested in finding an organizer or becoming an organizer, this is a great resource. 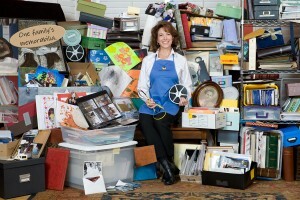 If you dig around their material, you’ll learn how much is involved in becoming certified as a professional organizer as well as what you should look for if you’re going to hire someone to come into your home to help get you even a little bit in the direction of my mother. Bottom line is the NAPO website is your go-to place to search for qualified, ethical individuals with the knack for sorting through the clutter and delivering a less stressful existence. I won’t recreate the wheel here by giving all the pointers on how to hire an organizer, because they have a great article on their website. http://www.napo.net/get_organized/how_to_hire.aspx. I happen to specialize in organizing photos, but there are lots of specialists out there who get their kicks out of sorting through anything and everything. Just a few of the categories include: Closet Design/Installation, Closet Organizing, Garages/Attics/Basements, Home Office, Kitchens and Moving/Relocation. So, if you have a special area you’re struggling with, this is a great way to narrow down your search for the right person to assist you. There are even “financial” organizers who can help you with your checkbook, paying bills. Suffice it to say, I didn’t plan to write a NAPO cheerleading blog today when I sat down to share, but it seemed like the right thing to do. I have many clients who use my help for organizing photos and then we connect them with the perfect home organizer for closets, kitchens, other around-the-house projects. It’s a great partnership for all of us to be working toward the same end…LESS STRESS! I’ve connected people in different states with great organizers in their area too..all thanks to NAPO. My most important tip, though, for finding the right “fit” is talk to the organizer on the phone and get a feel for their personality, technique. It’s like handwriting – we all have our own style. So, be sure to look for the right person in your area and you may find a helper for life.